Located in the center of Rzeszów, in the famous shopping complex, the Forum Hotel offers guests a comfortable stay in a unique atmosphere, great aesthetic design and unique dining experience at the restaurant. The hotel is located close to the bus station, railway station and airport. The hotel offers 34 classically and elegantly furnished rooms that combine comfort and convenience. The modernly furnished and comfortable rooms are a perfect place for both leisure and work. Rooms have air conditioning, telephone, radio, satellite TV, and broadband internet access. Guests have access to a car park. In each room, the internet works. In the morning guests will enjoy a delicious breakfast. The restaurant, in an intimate atmosphere and a relaxed atmosphere, guests can enjoy dishes of Polish and European. The cozy dining room works well during official banquets and small receptions. The cozy bar is a nice place regional where you can meet friends and hang out with coffee and drinks. It offers catering services and organizations receptions and banquets in the interiors and outdoors. The hotel has an air-conditioned conference room seats up to 60 people in the cinema. 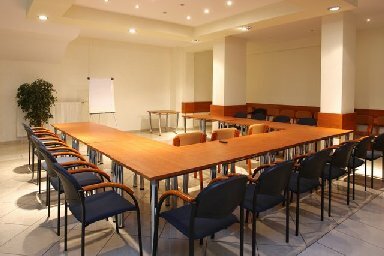 Additionally, a conference room can be used as an ideal place for a prestigious banquets, receptions, weddings and more. It is equipped with flipchart, whiteboard, screen, overhead projector, audio - visual equipment (TV, VCR, HiFi system, sound system, wireless microphones), broadband internet access.